I figured I would use this time to tell you about some of the crazy, techie stuff that’s been happening over my whirlwind week. The biggest bit of news: I participated in Start-Up Weekend last weekend – pretty much on a whim. I generally like to keep things in my happy little world. I like my comfort zone. I rarely push myself beyond that little realm. To be honest, the thought of trying new things generally throws me into an anxiety/panic attack unless I have time to examine and plan for it. Start-Up Weekend is not a new thing. It’s been in my circle for the past year or two. 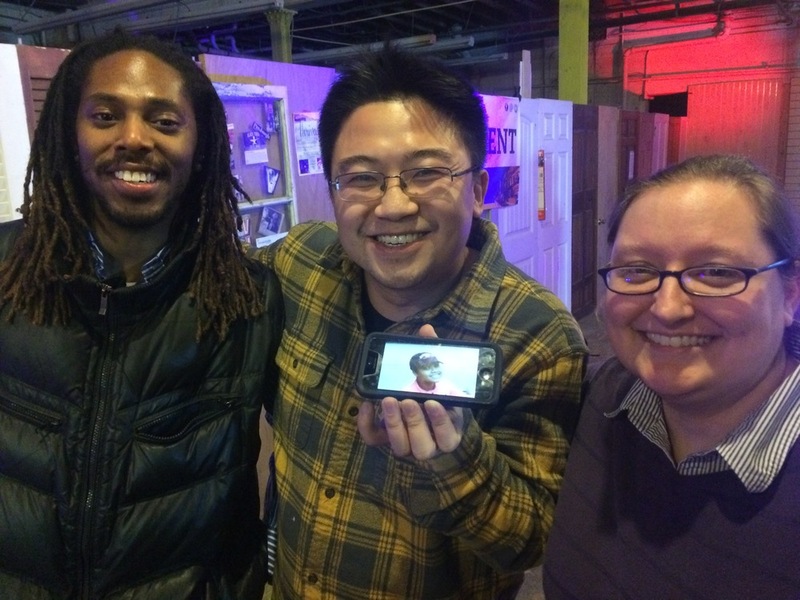 One of my friends was involved in a Start-Up Weekend event last year and helped create a cell phone app. I checked out her team’s demo during a start-up pitch last year. It was a pretty cool idea to see a group of strangers, who had literally met each other a short time before the demo, come together and create something truly amazing. When the current iteration of Start-Up Weekend rolled into my purview, it was pretty much the day before things were set to kick off that I purchased my participant ticket. For those of you who are unaware of what Start-Up Weekend is, let me go into a very brief detour: Start-Up Weekend kicks off on Friday evening with a meet ‘n greet mixer event. People come in with business start-up ideas. They meet other people with start-up ideas. After the meeting and greeting part, those with ideas for new businesses line up to pitch their idea (with the aid of a microphone and a stage) to the crowd. Once all the pitches are heard, the group votes on the ideas, and the top ten (10) pitches go on to the development phase. The people who pitched the top ten (10) ideas then formulate a team – utilizing anyone they may have brought with them for the pitch, and anyone who wants to join their team. They are encouraged to partner with people who can help them flesh out their idea over the next two (2) days. The group then works toward the common goal, and the weekend culminates in a presentation/pitch to a panel of judges who pick the winners. Our Start-Up Weekend consisted of 31 pitch ideas – that were then narrowed down to 10. While I could have easily partnered up with the lawyer whose idea was to develop an app to connect workers to a network of attorneys for assistance with things like work injuries, I opted for a group that would allow me to work outside of my comfort zone. After all, I wasn’t there to pitch an idea of my own – I wanted to work with a team to learn and expand on skills I don’t normally utilize. For starters, the company we came up with this weekend is SYLA (Support Your Local Artists). SYLA bridges the gap between local artists and businesses. In doing so, we provide exposure to local artists to showcase their work through not only our website and mobile app – but also through strategically developed community events. For example, our platform includes creative events such as a sculptor performing his or her craft at a local coffee shop to stir up communication, interest, and involvement. I was really excited when I put together a website (as simple as it is) by myself. I was even more excited when I was able to create a logo for the company. While I’m pretty good about working my way around the back end of a website – I’ve never actually created one by myself. Same goes for the logo. I’ve used Photoshop before, but usually to clean up something that’s already a well-established image. I’ve never actually created a logo myself, from scratch. Otherwise, I was able to bring my use of social media integration to the table for the group. So, it was a pretty good (and really, really, really long) weekend. When it came time for judging, I was perfectly content to have been able to be part of the experience, and to be able to show friends and family the cool logo and wesbsite that I did. What I didn’t plan on was winning third place. Yep. My team took third place with our start-up. And, that means that in addition to formally setting up this business we came up with over the weekend – we’re also advancing on to the next stage in the Global Start-Up Battle. This ultimately means that I’m looking for support from friends and family to help me and my team get there. Specifically, we’re looking to our community to click and vote! Our pitch is listed across six (6) options for the global event. You can click on each of the links below to go to the voting page and submit a vote for SYLA under each category. I thank you in advance for supporting the continuation of this unexpected path. If you’d like to chat more about it, hit me up and we can catch a coffee date – I’ve found that coffee is helping fuel me these days with all of this new businessy stuff between BOLD, Sorgatron Media, Sidekick Media Services, and now SYLA!